Featured: TRESCOM OPS ANNOUNCEMENT – New Dinosaurs Wreck Havoc In Trespasser! Make a choice, race the Raptor to the Redhawk, or get the hell out of here. I take the “get the hell out of here” option seeing as it’s a very tight race. Run down the valley to the left, and don’t look back. If you did get the gun at the top, you can go to the valley where two Raptors and an Albertosaur are waiting. However if you think fighting is wrong, stick to the ravine on the left. This is actually the faster way to get to the large rocks as you’ll meet no resistance on the way there. If you’re looking for a fight, then head to the ruins and pick up the AG-47 and waste the two Raptors.If you do this, you’ll have to fight the Albertosaur, tranquillise him but if you don’t have a tranquilliser I suggest you run at great speed. After walking, you will come across some large rocks. Go to the hill on the left and jump form rock to rock until you get to the next main level overlooking a nice valley. Begin down the hill and stick to the right. 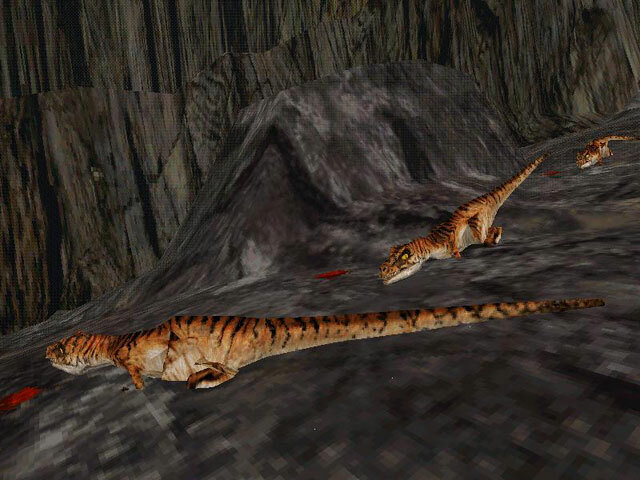 Shoot the Raptors as you start to go up the next hill. As it turns to mountain continue across the stone bridge, continue to the next tatty looking bridge, but not before you kill the next Raptor. I suggest on this bridge you balance along one of the rails, but it is possible to jump. Up the path is a Redhawk and a Hunting Rifle. Go down the valley where three more Raptors lie in wait. After dealing with them continue to the upper valley. When you get to the point where the valley goes left, upwards, or right downwards, choose right as the left branch takes you to a dead end. Now you’ll come to the stone pillars. There is are two Bennelli Shotguns in the pillars which you WILL need as you head up the mountain. Go up the mountain and take care of the two Raptors on guard there. Carry on up the mountain. Backwards and forwards up the switchbacks. As you get to the white rocks another two Raptors will attack. Try to trick them into running off the mountain to save ammo, otherwise pump them full of lead. As you carry on, you’ll find a Desert Eagle and a Hunting rifle. Carry on to two more Raptors, after that grab the AG-47. Head over to the familiar looking wooden bridge. Put a box on the near side of it to weigh it down. Now it’s a simple run and jump to the other side. After more walking and another Raptor there is a very ropey looking bridge. Again balance across the beam or be an idiot and jump the gaps. Another Bennelli and a Rifle are on the other side. Now back to basics. Throw a rock onto the board to lower it down, then run up it to the next level. Two Raptors are waiting. Run away or grab the SB5. If you run, go to the gun on the crate and have fun. As Ludlow said “Let’s carry on.” Go up the road and grab the Rifle and ammo from the truck, then head around the truck to the right. Now shoot the board until it makes a bridge and cross it. The crates ahead will enable you to climb the trucks and collect the Redhawks. Around the corner are three Raptors. Use your new Redhaws on them. By the trailer is an SG-47. Jump the crates, onto the trailer and walk out until it begins to tilt in a convenient bridge form. However I suggest you run like crazy at this point and jump to the other side, now watch the trailer fall down the cliff. Glad you jumped? This is the final puzzle of the level. Switches must have to be constantly pushed in order for the life to work. Use the switch furthest from the lift to lower it. Move the crate, which is between the other switch and the sheet of plywood. Stand on the elevator and throw something, or better yet, shoot the board to make it fall onto thw switch and raise you magnificently to the next level. The Summit.